We will do anything for love and the ones we love. Even if it resorts to following a love to the grave. And then meeting a new love who's already loved but love knows no bounds. That's essentially the plot of the rock opera Deep Love. With music and lyrics by Garrett Sherwood and Ryan Hayes and a book by Sherwood, Hayes, and Jon Peter Lewis, Deep Love is a confused rock opera that doesn’t seem to go anywhere. Deep Love is a sung through musical that follows a box of love. A box is love is a term used when all four characters in a show are involved in the sole love plot line. And it doesn't get much deeper than that. The story is super thin. In fact, you may have to ask your neighbor what exactly is going on. With the sing through style of the show, clarity of plot is essential in the lyrics. While some of the lyrics were absolutely beautiful, there were some moments it didn't alter the plot, stopping any momentum the story had going. The characters are simple and lack originality through arc. 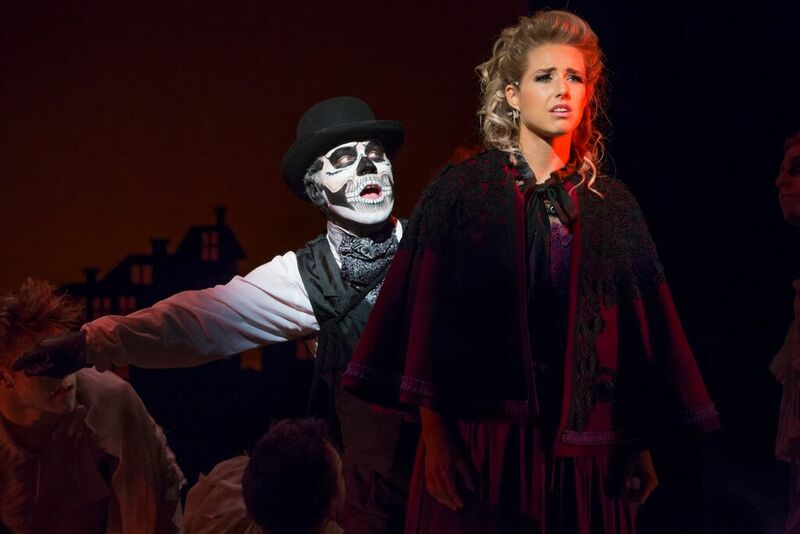 You could essentially compare Deep Love to The Phantom of the Opera. Scary skeleton dude stalks young ingénue. Ingénue meets hunky guy. Hunky guy falls for ingénue. The only addition to this story is hunky guy is already attached to axe-wielding hot girl with pipes of epic proportions. What's interesting about Deep Love is it began as a concert and it may actually be better suited as one. Or a concept album. Or even a dance piece. The storytelling is too weak to carry the show as is. The music by Sherwood and Hayes has a unique sound. Blending rock, jazz, folk, and pop, the score of Deep Love has some radio worthy numbers. And a capable quartet to belt them. Jon Peter Lewis is best known for his appearances on “American Idol” and “The Voice”, but Deep Love showed off the place where his vocals sit the best. As Old Bones, Lewis has a natural theatrical tone that showcased his mature sound effortlessly. Lewis had a presence on stage that allowed him shine bright. Screlting songtress Amy Whitcomb as Florence tour the roof off of the theater. Whitcomb’s vocal acrobatics were something you have to hear to believe. She is a powerhouse vocalist, doing things very few can imagine achieving. Garrett Sherwood as Friedrich is not much of an actor. In fact there was very little acting going on. Sherwood is a musician. He has the vocal grit of Chad Kroeger. It’s a unique tone for the stage. He also happens to look like a mash-up of Kroeger and Kenny G with those curly locks. While it’s clear that this piece was written for his voice, moving forward, bringing in an actor who can sing to play Friedrich may be the stronger option. As Constance, Melanie Stone was lost. Stone doesn’t have the vocal prowess as the others and had the blandest role in the show. With very little clarity, Deep Love needed a keen eye to guide what story was present. With Michael Rader and Jon Peter Lewis taking a stab at directing, things were just not clean. What did save the show though was the exquisite choreography by Ray Mercer. Mercer made the simplest of lyrical dance look striking. Decked out in a ghostly ensemble by Bree Perry, the five-piece dance troupe added palpable energy to the production. As a whole, the costume design by Perry looked stunning. Though time was lost in this world, the old meets new was a good look. The scenic design by David Goldstein did something that no other NYMF show did and that was utilize the scrim. Adding the cutout brought a new dynamic to the piece. With lights on the miniature light posts and gel on the windows of the miniature homes, Goldstein and lighting designer Braden Howard’s design was unified and vibrant. A special recognition should be given to Ariel LaFontaine for her brilliant make up design. Her work on Jon Peter Lewis gave Old Bones a necessary personality. No matter where this show goes from here, Deep Love is destined to be a cult classic. It all will depend on deciding the proper way to share the music. And a dance narrative may be it.